Well stated the whole op-ed. If this isn't Whistle-Blowing at it's finest I don't know what is. It should be recognized that in fact the California Endowment and other healthcare foundations are THE social detriments to all Californian's health. They hide behind organizations they fund who disguise themselves as champions to the underserved. Organizations who are actually doing their political dirty work by pushing for incremental bills and propping up bought and paid for politicians. Thank you Whistle Blower for uncovering and revealing the Single Payer killers hiding behind the curtain of advocacy. Excellent article exposing the forces that are at work to undermine efforts to create a fair and affordable health care system. Imagine. A health care system modeled after systems existing in most of the advanced industrial countries of the world, patients health is primary in determining the structure of the system. Imagine systems that cost about half percapita of our profit oriented system cost and where outcomes are superior to ours whlle covering EVERYONE. Imagine the ridculous price Americans pay for health care being transformed into increased earnings and funds that can improve our infrastructure and societal needs. This isn't a pipe dream. It's working and it's a proven model. The only thing exceptional about our health care system is it's inefficiency and inequity. They know single payer is coming but they want to slow it down as much as possible so they can fill their bags with even more cash. The Endowment leads the "incrementalists" ideologically with insurance profited money. And they control the Dem establishment. Gavin Newsom is aware. He is on their side. Keith McCallen's analysis is right on. Many who oppose Medicare for All fear giving up their comfy employer provided health care. All employers will be cutting benefits if the greedy health industry keeps on. This article is excellent. It is yet another warning to us voters that nothing will change in our health care universe unless we all, as individuals, begin to call and write to our California Assemblymembers and our State Senators and say, as strongly as possible that we want the system changed to single payer. We know that the medical corporations and the health care foundations have huge amounts of money at their disposal, but what they don't have is millions of voters. As one voter I can call my assemblymember. You can do the same. 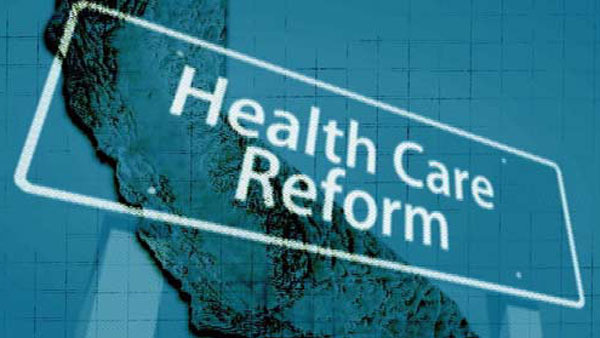 You can also join with like-minded voters in organizations like Healthcare for All-California. Politicians respond to numbers of voters. Without them, they don't get re-elected, regardless of their campaign dollars. Thank you, Keith McCallin, for calling attention to the subtle and insidious ways that hidden actors manipulate public opinion to undermine support for Medicare for All/single payer. This builds critical awareness needed to sustain the fight for the radical overhaul needed to our healthcare system. It is torturous to realize that entities we place our faith in have conspired to take advantage of that misplaced faith and instead have taken advantage of our trust and distracted us with shiny objects and insincere messaging. We're told that Medical for All/single payer is a socialist concept, and the expectation is that the majority of citizens should think that concept is wrong and anti-democracy. The fallacy is in thinking that our democratic form of government is working for all of us, fairly; it is not. When corporations (foundations) have more seats and greater influence at that proverbial table than we as tax-paying citizens do, then we must rise up and demand that the tables be turned, that the people we elect in our represented democracy work for us, our health and welfare, and that of our neighbors, too. This article presents an opportunity to take a shot at holding elected officials accountable, with intended consequences, beginning now.